I was selected as beauty tester so I received a chance to use <No Scratch! 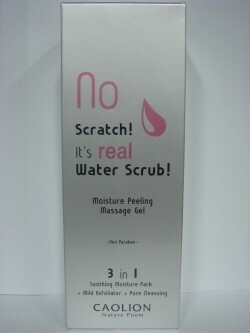 It’s real water scrub!- Moisture Peeling Massage Gel>. It was delivered in Caolion special box. I was touched with fast delivery. 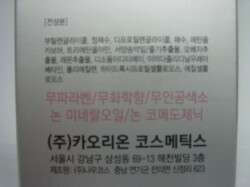 I received Beauty tester mission and Caolion Product catalog. The right picture is Peeling Gel. It catches my eyes with silver case and pink. The first photo is the back of the case. You could see in the Tip that you just wash your face after using moisture peeling gel with simple makeup. I was really impressed! It’s really nice product for lazy people like me. I shoot the side of the case on the second picture. You can see non, non, non,,, Right! Caolion!! Natural cosmetics! Let’s see our hero! 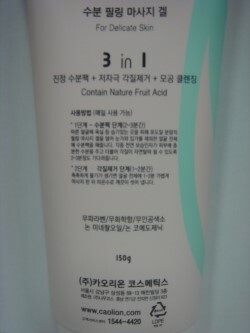 It has Soothing Moisture gel+Less sensitive Peeling+Pore Cleansing, three effect!! There are two steps using this product. The first step is moisture peeling and second is removing horny substance. The opening looks like first photo. You could see the silver blocker in the second photo. You could see that it has no color. If you magnify left photo, you could see white grain. The second photo is right after I applied on my hand. You could see the remained white grain in the second photo. The third photo is after 3 minutes. And that was moisture peeling step. I just sat applying and moisture appeared. I knew that my skin is oil type. When removing horny substances, it also tightens pores around my nose. What’s more, it soothes my skin so it relieves redness and it keeps moisture. I wanted to show you how to remove horny substances but I forgot to take pictures. People say that it’s not good to use peeling gel frequently but Caolion peeling gel is not only for peeling but also for keeping moisture. so I think we could use it frequently. Everybody! Be a beautiful skin woman with Caolion peeling massage gel!! 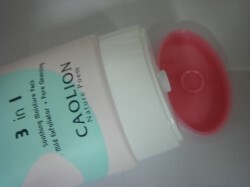 You could buy this product from http://www.wishtrend.com/caolion/123-caolion-moisture-peeling-massage-gel.html.